Whether you want to stay with oncology or try your hand at antivirals or very small medical devices, any one of these three stocks is better than Exelixis. In late 2012, Exelixis, (NASDAQ:EXEL) joined the extremely limited group of companies to successfully launch an internally discovered cancer therapy in the U.S. on its own. The company has done a fine job of marketing cabozantinib (commercially known as Cometriq) to America's extremely limited advanced medullary thyroid cancer population. Unfortunately, plans to expand the therapy beyond this indication have so far failed, and the company has been losing money since its launch. To be fair, Exelixis has had some awful luck. A phase 3 flop in prostate cancer set it back nearly a year and a half ago. It also began a phase 3 trial in advanced liver cancer in 2013, but the study isn't going anywhere fast. If there were a highly significant survival benefit, we probably would have heard about it by now. Since 2011, the diluted share count has grown 60% to over 209 million, and its debts have risen to more than 10 times annual revenue. Although there's still hope for Exelixis, it's an extremely risky stock with a rapidly diminishing potential reward. If you'll let me walk you through some figures, I can show you why Gilead Sciences (NASDAQ:GILD), Abiomed (NASDAQ:ABMD), and former Exelixis partner Bristol-Myers Squibb (NYSE:BMY) are better buys. Bristol-Myers Squibb: five in one, or one in four? Exelixis' ability to commercialize cabozantinib in the U.S., Canada, and Japan on its own, and then strike a deal with Ipsen for commercialization outside these territories, is commendable. Still, I think you'd be better off with Bristol-Myers. Interestingly, Bristol-Myers and Exelixis inked a collaboration deal in 2008 -- which Bristol backed out of just two years later. If I had to guess, I'd say Bristol's cancer-fighting Opdivo was beginning to show promise around the time Bristol ended its affair with Exelixis. Whether or not that was the case, Opdivo's regulatory success is off the charts. The immuno-oncology superstar won its first FDA approval in December 2014 and within a year expanded that label four times. That's five approvals in less than one year -- plus Opdivo scored its sixth as a combination with Yervoy for treatment of advanced melanoma this past January. Exelixis, on the other hand, has been pushing its oncology candidate along at a far slower pace. It's been nearly four and a half years since cabozantinib won its first and only approval. The good news is that the FDA allowed Exelixis to submit data for advanced kidney cancer as it accumulated last fall.The company completed the application just in time for Christmas last year, and in January the agency granted it a priority review. That hardly a guarantee, but an approval for advanced kidney cancer seems likely to increase cabozantinib's addressable U.S. population by roughly 17,000 patients per year. The company expects a decision this June. Unfortunately for Exelixis, Bristol's application to expand Opdivo to the same population was approved last November, just one week after Bristol announced the FDA had accepted it. If Exelixis had the resources to run its phase 3 advanced kidney cancer earlier, it may have had a chance to gain a toehold in the indication. But by the time Cometriq is available for these patients, Opdivo will be relatively entrenched. I'll be surprised if the expansion will be enough to push Exelixis into profitability, if it's even approved in the first place. Opdivo isn't the only reason I think Bristol-Myers is a better buy than Exelixis, but this situation highlights the disadvantages of developing oncology therapies with limited resources. If the tale of Bristol-Myers, Exelixis, Cometriq, and Opdivo has left you weary of oncology, allow me to suggest an antiviral champion: Gilead Sciences. Recent patent disputes with Merck over the main ingredient in its hepatitis C virus franchise, sofosbuvir, haven't helped the shares recover following the latest biotech meltdown, but the damages appear minor. Also overblown is the extent to which Merck's recently approved hepatitis C antiviral Zepatier will hinder Gilead's growth in the years ahead. While another market entrant will affect Gilead's pricing power somewhat, sofosbuvir-containing combination drug Harvoni is still a favorite among physicians because of its superior efficacy and safety profile. Also, the extent to which U.S. insurers have been denying infected patients access to the hepatitis C antivirals is just coming to light, which means there will be plenty of demand for years to come. 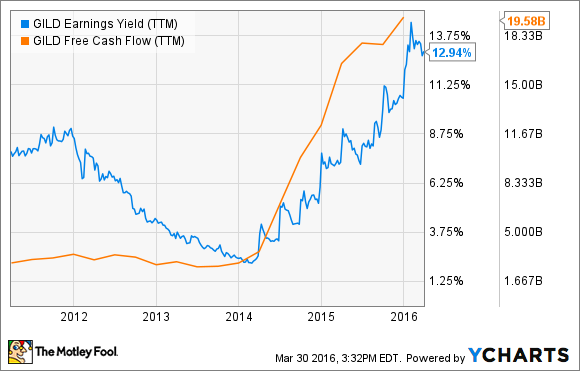 Granted, Gilead's free-cash-flow growth of the past couple of years will probably level off. Even so, one important thing to bear in mind is that at recent prices, Gilead's earnings yield -- earnings per share divided by the stock price -- of nearly 13% is higher than the average return of 10% on the S&P 500. Gilead isn't using this cash to bloat up with acquisitions. Instead, it's returning it to shareholders with enormous share repurchases and dividend payments. Admittedly, a yield of about 1.8% at recent prices isn't the juiciest on the market, but $12 billion in share repurchases approved when the stock hit its low point in early February, added to the $15 billion approved last January, will make raising that distribution much easier in the years ahead. If Bristol and Gilead don't appeal to you because of their size, than perhaps you might be interested in Abiomed. With a market cap of $4 billion, it's much larger than Exelixis, but still small enough to provide the excitement some small-cap healthcare stock investors enjoy. The three months ended Dec. 31 were its best quarter yet in terms of devices delivered and sales. Results are looking so good that Abiomed raised revenue guidance for fiscal 2016 (which ended March 31) to $326 million from a previous range that topped out at $315 million. This medical-device maker is successfully commercializing the tiniest heart pumps in the world. The Impella 2.5 is a 3mm catheter with an inlet valve that stays in the left ventricle, and a 4mm diameter pump that pumps 2.5 liters per minute into the aorta. There's a 5.0 version that pumps up to 5 liters per minute, and two more nuanced devices that recently earned premarket approvals from the FDA in March. Last year's banner year was largely due to a premarket approval for use of the Impella 2.5 in patients undergoing high-risk percutaneous implant procedures. The approvals bestowed in March expand the use of four of its pumps for use in emergency patients suffering reduced blood flow following a heart attack or cardiac surgery. The stock's price of nearly 33 times trailing earnings is awfully high, but following these four approvals, it just might be worth it. Granted, a string of successes could cause Exelixis stock to outperform all these companies. If you share my aversion to risk however, these three options are far better buys.